Ambassador Arturo Sarukhan is an international strategic consultant and advisor, and the former Mexican Ambassador to the US (2007-2013). He is a Non Resident Senior Fellow at The Brookings Institution and Distinguished Visiting Scholar at the USC Annenberg Public Diplomacy School. He is a digital diplomacy pioneer, becoming the first Ambassador accredited to Washington to use Twitter in an official capacity. The grandson of conflict refugees in Mexico, he is a career diplomat and received the rank of Career Ambassador in 2006. He first served in the Mexican Foreign Ministry as Deputy Assistant Secretary for Inter-American Affairs. He was posted to the Mexican Embassy in the United States in 1993, where he served as Chief of Staff and then as head of the Counternarcotics office. 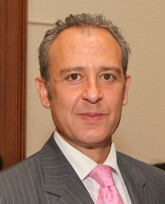 In 2000, he was designated Chief of Policy Planning at the Foreign Ministry, and in 2003 was appointed by the President as Mexican Consul-General to New York City. In 2006, after requesting a leave of absence from the Foreign Service, he joined the Presidential Campaign of Felipe Calderón as Foreign Policy Advisor and International Spokesperson. He then became coordinator of the foreign policy Transition Team for then President-elect Calderón. He served as Mexican Ambassador to the United States for half a dozen years, the youngest and longest serving Mexican Ambassador in Washington in modern times. During his tenure he became the Dean of the Group of Latin American Ambassadors (GRULA) to the US. Ambassador Sarukhan holds a B.A. in International Relations from El Colegio de México and an M.A. in U.S. Foreign Policy from the School of Advanced International Studies (SAIS) of Johns Hopkins University, where he was a Fulbright Scholar and Ford Foundation Fellow. He has been decorated by the governments of Spain and Sweden, and has received several awards in recognition of his diplomatic achievements. Ambassador Sarukhan sits on several boards -including the Americas Society, the Annenberg-Drier Commission at Sunnylands and the Inter-American Dialogue- and participates in task forces with NGO’s, think-tanks and academic institutions. In 2010, Ambassador Sarukhan was included in the List of Global Leaders of Monocle magazine and for five years in a row, has been on The List of 300 Most Influential Mexican Leaders by “Líderes Mexicanos” magazine.